State Council Clears Patent Law Amendments, Forwards to NPC, Patent Linkage Is Not Referenced …. In order to further strengthen the protection of the legitimate rights and interests of the patent rights holder, improve the mechanism system for stimulating creation of inventions, and raise those mature practices for effectively protecting patents into law, the meeting passed the “(Draft) Amendments of the Patent Law of the People’s Republic of China.” The Draft aims to increase the severity of penalties for intellectual property infringement, draws on international practices, significantly increase the amount of compensation and fines for willful infringement and counterfeiting of patents, and significantly increase the cost of infringement to deter illegal acts; it clarifies the burden of proof for the infringer to cooperate in providing relevant information, and sets forth that the network service provider should bear joint liability for not stopping infringement in a timely manner. The Draft also clarifies the incentive mechanism for inventors or designers to equitably share the proceeds from the creation of service inventions, and improves the patent authorization system. The meeting decided to bring the Draft to the NPC Standing Committee for its review. In a possibly unrelated development, the National Development and Reform Commission released a Chinese interagency Cooperation Memorandum of Understanding on December 4, 2018 to deal with entities that have lost trust due to IP (patent) infringement. 关于对知识产权（专利）领域严重失信主体 开展联合惩戒的合作备忘录. Compared to the proposed patent law amendments, this lengthy document focuses even further on public law aspects of a patent law system, including recidivist infringers, “irregular” patent applications, providing false documents to the patent office, etc. and includes a range of 33 different punishments to be meted out from a wide number of agencies, including denial of subsidies, debarment for procurement purposes, denying access to range of government programs, prohibiting leisure travel, etc. The two documents taken together may suggest a disheartening renewed emphasis on administrative measures to deal with patent infringement and innovation incentives. Such measures may be intended to address US trade concerns about IP infringement and “IP theft”. They may also represent a return to China’s increasingly administrative enforcement-oriented approach to patent issues. However, this renewed focus on administrative measures is also occurring the same time as China is moving to quickly establish a new national appellate IP court attached to the SPC by as early as the beginning of 2019. This new court will be a national appellate circuit court with jurisdiction over administrative appeals and technical IP matters and will likely include seasoned judges from Beijing and the SPC itself. Much work needs to be done to get this court off the group quickly. What, however, is missing from both these documents is any reference to a patent linkage system for pharmaceutical products, which has been much talked about in this blog. As previously reported, former CFDA Commissioner BI had been dismissed from his post as party secretary to SAMR this past summer in response to China’s tainted vaccine scandal. A State Council notice (no. 83) of August 20, 2018 on deepening reform in China’s medical sector thereafter also ominously omitted any reference to patent linkage. As the original deadline for passage of the patent law amendments was the end of this year, my guess is that this draft may be referred on to the NPC by the end of this year, and passage may occur as early as the first half of next year. I assume that a draft for public comment will be released by the NPC sometime early next year. Generic and innovative pharmaceutical companies that believe a linkage system would help accelerate innovation in the pharmaceutical sector and support early introduction of high quality generics, may consider commenting on these issues once a public comment draft is made available. 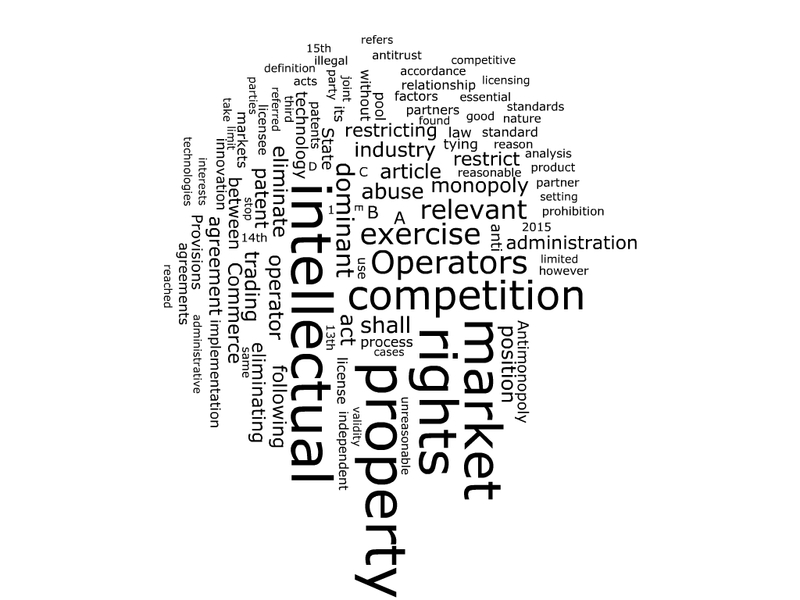 NDRC has released a draft for public comment of its Antitrust Guidelines for Abuse o IP知识产权滥用的反垄断指南（征求意见稿）(English language wordcloud above). As with the NDRC questionnaire this appears to have been selectively released although some versions have also been made available on line by bloggers and the like. Several organizations are commenting on it, and some bloggers have made its content publicly available. The release of the guidelines has also been reported by the media based on NDRC presentations at public conferences. Below is what I believe is the Chinese text regarding on abuse of dominance involving intellectual property rights. Unfortunately I do not have an English text I can release. I have added English captions so that non-Chinese readers can see some of the key areas discussed. I did notice that the provisions on the availability of injunctive relief for infringement of standards essential patents thankfully address “whether the two negotiating parties in the process of negotiations have shown real willingness to negotiate”, which I believe is a significant problem in the Chinese environment. Interestingly, in addressing the problem, the draft incorrectly identifies requests for injunctive relief as “the request of the patentee of a judicial body to issue an order to enjoin use of relevant patents.” In fact, I believe the injunctive relief that is sought is typically to enjoin infringement, as there has been no authorized use of the patents in the absence of a license. I am also wondering whether other agencies, notably MofCOM and SAIC are also preparing drafts of the abuse IP guidelines, particularly as SAIC only recently released its rules in this area. the role of applications for injunctive relief in negotiations of the parties, competition in the relevantmarketand the downstream market, and the effectson consumer welfare. Injunctive relief as referred to in this guide, refers to the request of the patentee of a judicial body to issue an order to enjoin use of relevant patents. The American Bar Association has once again made publicly available its response to the NDRC questionnaire on drafting IP abuse guidelines, attached here. This is a useful and large bilingual download which contains useful background materials. Some of my prior recent blogs on this questionnaire include a posting of George Mason University’s comments, and my comments on the questionnaire itself. Thanks again to the ABA for the transparency of its efforts! 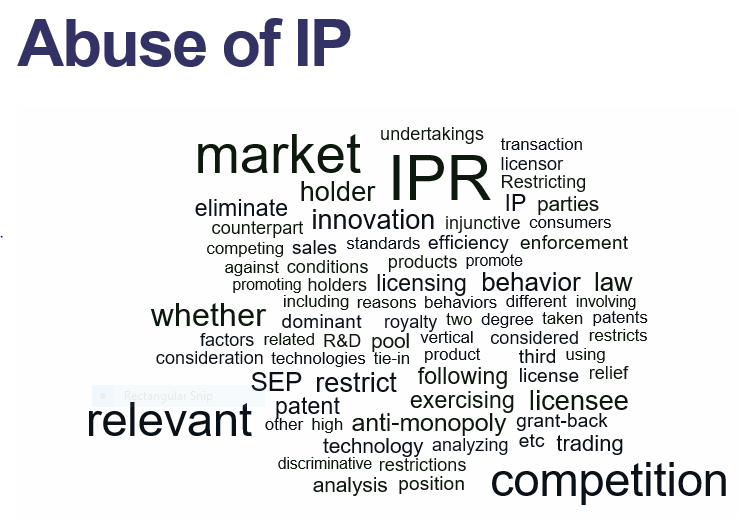 Attached are the comments in Chinese and English of George Mason University’s Global Antitrust Institute on the Questionnaire on Intellectual Property Misuse Antitrust Guidelines distributed by NDRC. The Director of the GAI is Joshua D. Wright, a former U.S. Federal Trade Commissioner. The GAI’s International Board of Advisors is chaired by Douglas H. Ginsburg, a Senior Judge on the United States Court of Appeals for the District of Columbia, and a Professor of Law. Koren W. Wong-Ervin is a former Attorney Advisor to then-Federal Trade Commissioner Joshua D. Wright and is also an author of this comment. I hope that these comments by leading experts in the field are helpful to Chinese colleagues, and I appreciate the transparency of the commentators in providing them to this blog. • Qualcomm will offer licenses to its current 3G and 4G essential Chinese patents separately from licenses to its other patents and it will provide patent lists during the negotiation process. If Qualcomm seeks a cross license from a Chinese licensee as part of such offer, it will provide fair consideration for such rights. • For licenses of Qualcomm’s 3G and 4G essential Chinese patents for branded devices sold for use in China, Qualcomm will charge royalties of 5% for 3G devices (including multimode 3G/4G devices) and 3.5% for 4G devices (including 3-mode LTE-TDD devices) that do not implement CDMA or WCDMA, in each case using a royalty base of 65% of the net selling price of the device. • Qualcomm will give its existing licensees an opportunity to elect to take the new terms for sales of branded devices for use in China as of January 1, 2015. • Qualcomm will not condition the sale of baseband chips on the chip customer signing a license agreement with terms that the NDRC found to be unreasonable or on the chip customer not challenging unreasonable terms in its license agreement. However, this does not require Qualcomm to sell chips to any entity that is not a Qualcomm licensee, and does not apply to a chip customer that refuses to report its sales of licensed devices as required by its patent license agreement. The NDRC imposed a fine on the Company of 6.088 billion RMB (approximately USD 975 million), which Qualcomm will not contest. Qualcomm will pay the fine on a timely basis as required by the NDRC. The settlement appears to identify certain issues which likely were actively negotiated, including, the smallest “unit” based upon which royalties may be collected, compensation and negotiation for cross-licenses from Chinese licensees, dates of application of newly imposed licensing terms, royalties and licensing practices for essential and non-essential 3G and 4G patents, calculation of any different Chinese domestic market royalties, sales of chips in conjunction with royalties and calculation of a fine. It is unclear from this announcement how significant a difference the prospective licensing terms are from Qualcomm’s current licensing regime, and the impact, if any, on this new licensing scheme on Qualcomm’s global licensing practices. It is also unclear at this time how proportional this penalty and rectification program is compared to other NDRC investigations.